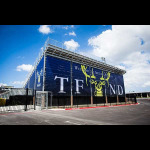 Description: Custom designed and professionally installed STURDIWRAP stadium banner systems enhance the look & feel of your facility through eye-catching displays. 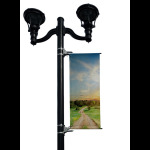 BannerSaver - BannerSaver™ - Light Pole Banner Bracket - Large Kit for Banners 20 to 23 Sq. Ft.